The Truffle Kerfuffle - or was it the Truffle Oil Kerfuffle? Truffle Kerfuffle - or Truffle Oil Kerfuffle? It’s not snobbery. Truly it isn’t. It’s just that truffle oil doesn’t taste like truffles. Or rather, it has one note that resembles the truffle flavour in a very unsubtle, strident way. In fact, it’s a chemical – a chemical called 2,4-dithiapentane – and it’s made in a laboratory, marketed as “truffle aroma” and added to olive oil to produce an approximation of the real thing. 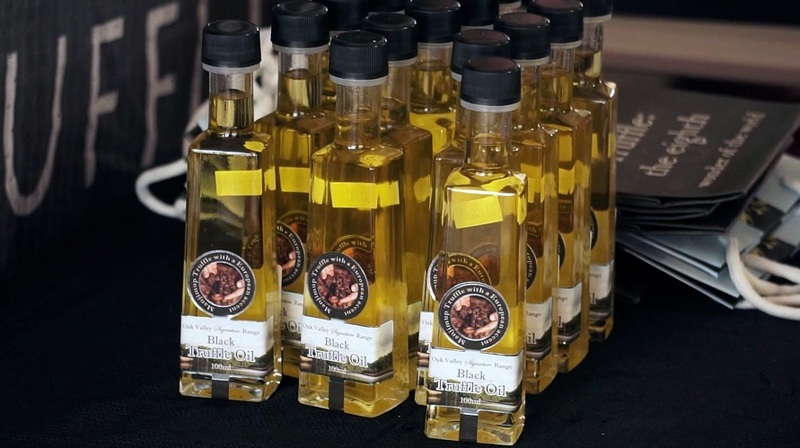 Truffle oil or aroma is useful for training truffle dogs, since it’s relatively cheap, inorganic and never goes off. Unfortunately, it is still used in food. Even at this festival in the heart of Australia’s biggest truffle-producing region. 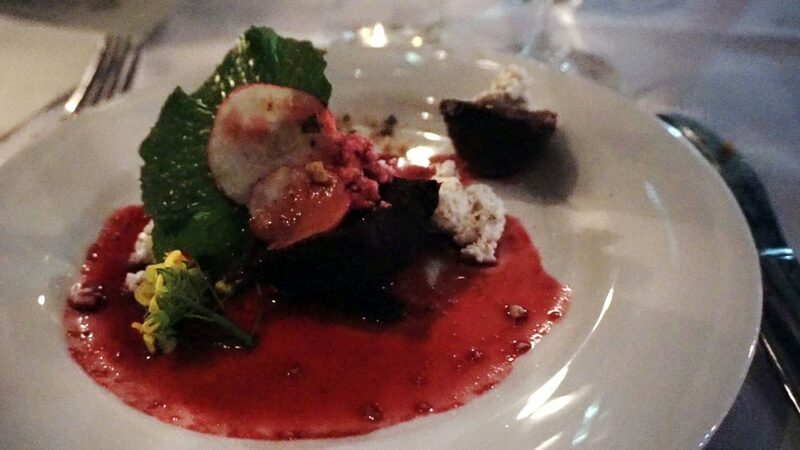 The Truffle Kerfuffle is, in most respects, everything a food festival should be. It has a nice website, good organisation, lots of parking, a good line-up of events, a beautiful venue and lots of participating, local producers. But when you bite into an empanada or sample the fries with truffle aioli and end up with a hit of 2,4-dithiapentane it’s pretty disappointing. There were exceptions, of course. The truffled ale from Blackwood Valley Brewing Company was a very nice drop. Sadly, it was only available in drops – small tasting portions. This first experimental batch was too small to supply even the festival bar, let alone a wider market. It may be available later in the season but only, I fear, in the West. Fortunately, the dreaded oil didn’t make an appearance at the “From the earth” dinner on Saturday night. I guess they didn’t want to call it a “From the laboratory” dinner. However, truffles didn’t make much of an appearance either. Generally speaking it seemed that the chefs, James Viles from Biota in Bowral and Kiren Mainwaring from Co-op Dining in Perth, were rather mean with the famous fungus. We started with a glass of “Truffle Royale”, which we guessed to be a mix of truffled mead and sparkling wine. This came courtesy of Liberté, a wine bar in Albany. Tossing back the black sediment at the bottom of the glass was only time we saw a substantial amount of truffle. But then, the lighting in the tent was dim and truffle is black and I wasn’t wearing my glasses…. We waited a long time for any actual food to emerge from the festival kitchen. Fortunately we were entertained by ample quantities of local wine and the other guests at the long table. Finally the sourdough bread and truffle butter platters emerged. That helped to soak up the alcohol and provided a solid truffle hit. But in terms of truffle, it was downhill from there. The theme for the dinner was local produce so, naturally, there was marron. 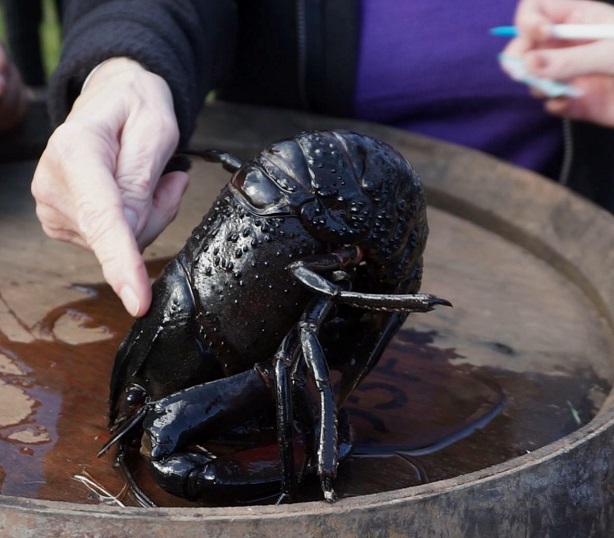 During the day we had watched, fascinated, as one of these giant freshwater crayfish was stroked gently on its carapace until it simply went to sleep. At the dinner, the marron (now dead rather than sleeping) came with cauliflower, egg yolk and truffle. It was the highlight of the meal and yes, the truffle was present, if not especially assertive. All the courses were named simply as a list of ingredients. Next (after a longish pause) came ‘Ewes milk, beetroot, wasabi, hazelnut, truffle’. Delicious, but the truffle was overwhelmed by the beetroot. Another long pause followed – a pattern for the evening. There were a lot of people. So it must have been challenging for chefs removed from their own kitchens and plonked down in what was essentially a caravan park restaurant with basic cooking facilities supplemented by a giant truck. Our shuttle bus dropped us off at 7.00 and was due to return at 11.30 and for a while there we thought we might have to skip a course or two to make it. The next course, ‘Perch, creamed hen eggs, kelp butter, truffle’, was a lovely meld of flavours and, apart from the odd fish scale, another favourite for the night. But the truffle was undetectable. This was followed, eventually, by ‘Chestnut fed Wessex Saddleback, spaghetti squash, red walnut, baby leek’. Perhaps not the most successful dish, as it was a bit hard to find the pieces of pork in the mound of slightly bland squash. Pleasant but not pretty. Sadly, the ‘Red cabbage, meat juices, tri tip (beef) and truffle’, was a low point. The tri tip comes from the sirloin and is a full flavoured, lower fat content and comparatively lower cost cut that is typically barbecued or grilled, then served sliced. In this case the low fat content didn’t work in its favour and it was tough and dry. What’s more, by 11pm we were ready for dessert, not another meat dish. The 2013 Picardy Shiraz that came with it was delicious, however. 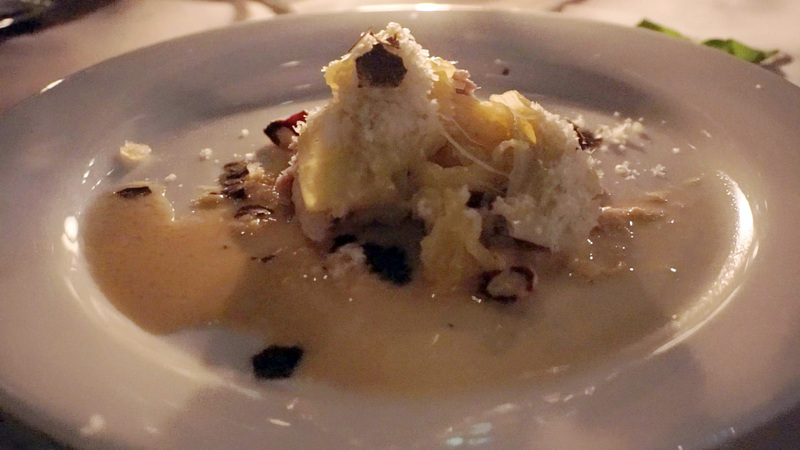 There was barely time to toss down the ‘Karri honey, hazelnut, pear, milk, truffle’ (truffle? where?) and take a sip of the rather nice Mountford Tangletoe Cider before we were rushed out the door (or out of the tent flap) onto the bus. On the whole, it was a disappointing night. According to our Perth-based table mates, this Truffle Kerfuffle dinner was but a poor shadow of the one they attended a few years back. If you were unfamiliar with truffle, you’ d be excused for wondering what all the fuss was about. Not enough truffle in a dish and you might as well leave it out altogether. But there you go. As my daughter would say – first world problem. At least there was no truffle oil.